My new Etsy shop is up and running. I’ll be listing new vintage, fabric and craft items each day. Come visit and let me know if you’re looking for anything in specific. There are many talented crafters and bloggers with shops here. I originally found Catherine at Art from the Heart & sewing on paper during OWOH One World, One Heart), but immediately fell in love with her work. I purchased this piece from her ETSY shop and it’s already here and even better in person! Many of you know, but most don’t that I have a penchant for weddings and sentimental images of weddings. Hubby and I are finally having our “Happily Ever After Fairy Tale Ending”, but it was a long time coming after surfing some very rough seas and we take it very seriously. 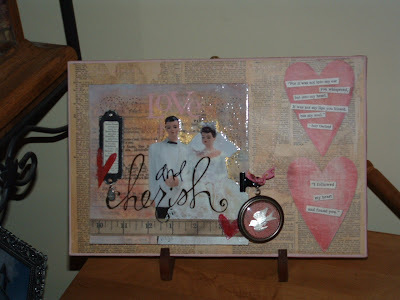 So, this piece that Catherine crafted is very special to us and it was just in time for Valentines Day!